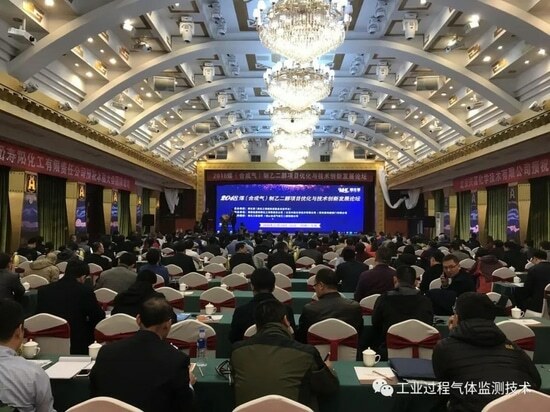 The optimization and technical innovation forum of coal (syngas) to MEG has been smoothly held in Taiyuan, Shanxi, China in November 15, 2018 . The general manager of Cubic Ruiyi Instrument Co., Ltd -Dr. Xiong attended the meeting, and gave a speech about “the analysis of the R&D and application of laser Raman spectroscopy gas analyzer”. The meeting is for the outlook of coal (syngas) to MEG industry, the latest project progress, process optimization and operation experience, engineering design and technical innovation points. The participants discussed about the related technology, equipment application and the integration direction of the downstream polyester industry . The forum invited owners of coal (syngas) to MEG production projects that have been put into operation, planned and under construction, coal (syngas) manufacturing technology patent licenser, MEG, engineering design, technology and equipment producer, catalyst production enterprises, research institutes and downstream users. They attended and communicate with each other on the forum. 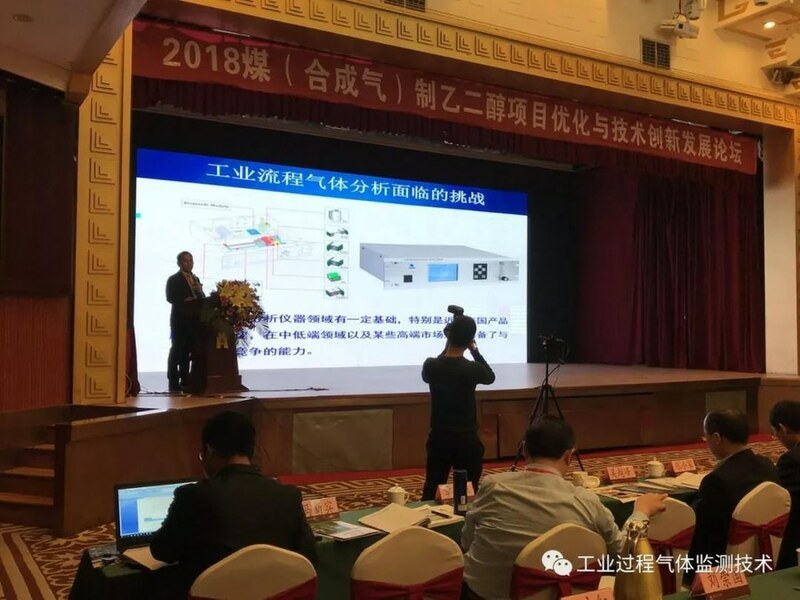 Cubic-Ruiyi, as a complete gas monitoring solution provider for coal (syngas) to MEG process gas monitoring, was invited to attend the meeting. In the meeting, the general manager - Dr. Xiong made a report about the technical theory, advantages and applications of Laser Raman Spectroscopy Gas Analyzer LRGA-6000. Dr Xiong mentioned that Laser Raman Spectroscopy Gas Analyzer LRGA-6000 is based on the principle of laser Raman scattering, which enhances, collects, processes and identifies the characteristic Raman scattering spectra of the gas to be measured and quantifies the content. Online real time measurement for various gases on full range simultaneously. Comparing with the current gas monitoring technology of coal (syngas) production of ethylene glycol process in China, he emphasized: "currently, the commonly used gas analysis technology in China -- GC gas chromatography technology and MS mass spectrometry technology are mostly imported. MS is expensive, costly to maintain and complex to operate. 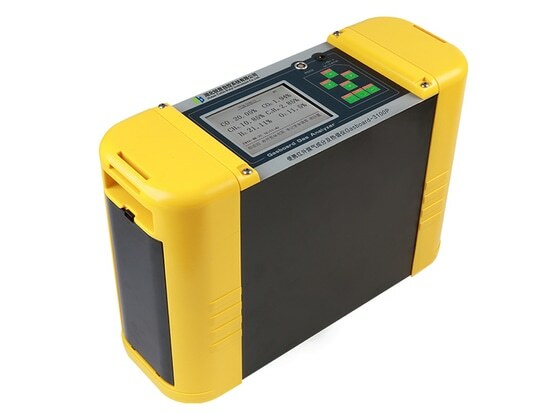 But the laser Raman Spectroscopy gas analysis technology is simple to operate, does not need the carrier gas and consumables, the price ratio is high, is more suitable for coal (syngas) production ethylene glycol process gas monitoring." For the monitoring of interferential process gas with low gas density, small signal, Dr. Xiong said, "through the core hardware of LRGA - 6000, such as generator, collecting device and detection device, increasing laser power, gas pressure, the optical path, scattering wide range collection, etc. These technology innovations, and laser Raman software algorithm based on Ar basal deducted automatically, automatic correction based on the calibration gas interference, eliminated the influence of the environmental temperature, pressure and the interference of measured gas, realized the high precision of the gas monitoring process of low density." Laser Raman Spectroscopy gas analyzer LRGA - 6000 won "national major scientific instruments and equipment development projects" in 2012. 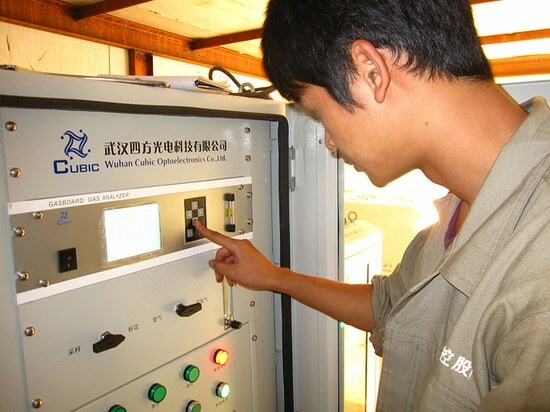 After five years’ technology research and development application, LRGA-6000 passed the project acceptance, and is widely used in natural gas, ethylene cracking gas, biomass fuel gas, transformer oil dissolved gas, the coal chemical industry and so on various areas, laser Raman spectroscopy gas analyzer in coal glycol is successfully applied in the project. A large coal (syngas) ethylene glycol in shanxi used LRGA - 6000 for real-time online monitoring the gas components of H2, N2, O2, CO, CO2, CH4, NO, CH3OH, CH3O - NO, , H2S, COS recyclable and the gases which are needed low pollution emission caused by the key production of coal gasification device, gas purification plant, MEG synthesis device. In order to optimize the production process, improve purity of preparing MEG, ensure oxalate ester synthesis rate and recovery of nitrous acid ester, reduce pollution emissions and realize green and clean production. The project site carried out a comparative analysis of LRGA - 6000 detection results and the chromatograph and the online instrument test data from a central control room copy . The three test data are consistent. through the contrast analysis of the three test data are consistent. The response of LRGA - 6000 is faster than the chromatograph, highly recognised by the on-site staffs, and considered that the instrument is accurate, fast response and it can help the staff grasp the whole process more accurate and quickly. 2018 is a year of rapid development in the planning and construction of coal (syngas) to MEG project. Up to now, 20 projects (excluding MTO devices) have been put into operation, with a capacity of 3.54 million tons. New and planned projects are constantly increasing, and production capacity continues to expand, which is expected to exert more influence on the raw material market of leading polyester enterprises in the downstream. At the end of the report, Dr. Xiong expressed the prospect of domestic coal (syngas) to MEG production process, technical equipment and industrial prospects, hoping that the localized development of laser Raman spectroscopy gas analysis technology could facilitate the optimization and technological innovation of coal (syngas) to MEG project. The online analyzer pretreatment system removes and adjusts the gas to meet the conditions required for the analysis instrument. Gasboard—3100P portable infrared syngas analyzer can be used for measurement of the concentration of CO, CO2, CH4, CnHm, H2 and O2 in sample gases simultaneously and also calculated heating value (caloric value) automatically. Powered by Li- ion battery. Based on the NDIR and Thermal Conductivity Detector. 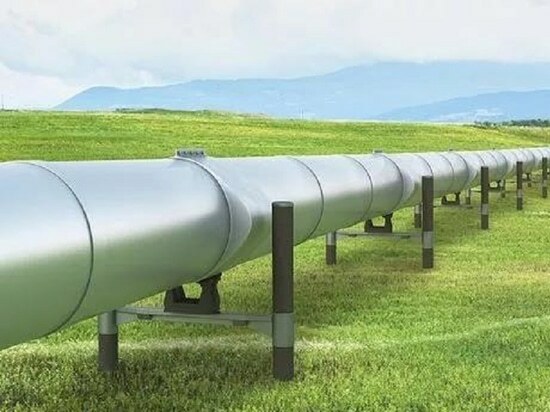 Natural gas measurement, as an important basis of natural gas trade and calculation, reflects the fairness and justice of both sides of the transaction, and has attracted wide attention. Why is energy measurement essential to the natural gas trade? Why is energy measurement essential to the natural gas trade? 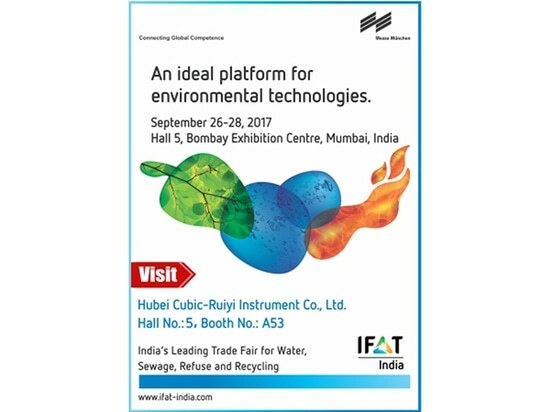 We Hubei Cubic-ruiyi Instrument Co., LTD will attend the IFAT India 2017 Time: September 26–28, 2017 Address: Hall 5, Bombay Exhibition Centre, Mumbai, India Our booth: Booth #A53 at Hall # 5 Looking forward to meeting you onsite!